The American criminal justice system holds more than 2.3 million people in 1,719 state prisons, 102 federal prisons, 901 juvenile correctional facilities, 3,163 local jails, and 76 Indian Country jails. There are also people locked up in military prisons, immigration detention facilities, civil commitment centers, and prisons in the U.S. territories according to statistics taken from the Prison Policy Initiative, a nonprofit, non-partisan prison advocacy group. This nation has the dubious distinction of having the highest incarceration rate in the world and 2017 was a year of continued outreach and advocacy by activists fighting for the rights of men, women and children in U.S. prisons. It was also a year of violence and uprisings in penitentiaries with prison riots and unrest across the country from Delaware to California. According to news reports hundreds of inmates—some armed with baseball bats and iron pipes—rioted at an Oklahoma federal prison in July for about eight hours, taking two guards hostage. Correctional officers compared a Kansas prison to “a Third World country” after a violent inmate uprising in September that saw multiple fires set in the facility. Inmates smashed windows throughout the Norton Correctional Facility. They took over staff offices and destroyed computers. Also in September a riot involving more than 160 inmates happened at the California Men’s Colony near San Luis Obispo, a central California prison. One prisoner was stabbed to death and eight others wounded, state corrections officials said. At the James T. Vaughn Correctional Center in Delaware, 16 inmates were charged with murder during a prison riot in February. According to shadowproof.com, prisoners took hostages and held Building C at the facility for nearly 24 hours. “They demanded access to rehabilitation and education services, and spoke out against ‘improper sentencing orders, status sheets being wrong, [and] oppression towards the inmates,’” the site reported. They also said their protest was against President Donald Trump, “everything that he did” and “all the things that he’s doing now,” it was reported. “Many of our people and others don’t believe that the U.S. Government conspires against Black people. Under Bill Clinton, the total numbers of state and federal inmates grew more rapidly than under any other president who waged war on drugs including Richard Nixon, Ronald Reagan, and George H. W. Bush,” said Abdullah Muhammad, Student National Prison Reform Minister of the Nation of Islam. “I see President Trump’s mindset unleashing the police on Black people, our youth, in particular, this coming year leading to more arrests to feed the Prison Industrial Complex for profit and the police claiming more so-called justifiable homicides,” he said. 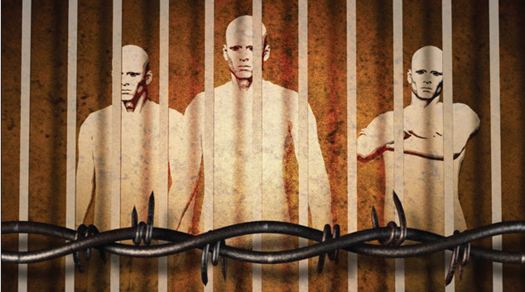 The causes for these uprisings in 2017 were eerily similar: overcrowded, understaffed facilities plagued by mismanagement, a lack of communication, a culture of negativity, and adversarial relationships between prison staff and administrators. The treatment of the incarcerated was also a prominent issue. There were significant questions for the Milwaukee County Jail and its Sherriff’s Department about the death of Terrill Thomas, 38, an inmate found in his cell a year ago. The cause of death was “profound dehydration” after being deprived of water for seven straight days, the medical examiner said. An inquest convened by the city’s prosecutor believed someone should be punished, too. The jurors came back May 1 with a recommendation that some county jail workers face charges. This phenomenon is not just a symptom of poverty or poor choices, but evidence of a new racial caste system at work, like Jim Crow and slavery before it, she explains in her book. “This system is just the latest manifestation of whites’ ongoing racist conspiracy to subjugate blacks,” she writes. The recent study “Measuring the Social Impact of Mass Imprisonment on America’s Black and White Families and Communities” outlined the impact of mass incarcerations for the Black community in 2017. “According to recent estimates, one of every 15 Black men is held in jail or state or federal prison, compared to one of every 106 white males. This racial disparity has a big impact on the life fortunes of white and Black men—contributing to gaps in many domains, ranging from jobs and family life to health and mortality,” wrote authors of the study. “People who go to prison are removed from families, neighborhoods, and friendship networks, leaving their children, partners, friends, and neighbors to bear greater economic burdens and social challenges in their absence. The devastation for families and communities has been enormous—especially for Black Americans, whose daily lives and economic fortunes bear the brunt of the prison boom,” authors concluded. The “law and order” tactics of U.S. Attorney General Jeff Sessions and some of the policies he introduced this year caused concern among prison justice advocates. In May, Atty. Sessions announced new federal sentencing policies for drug offenses, reversing Obama-era reforms. Previously instituted changes were beginning to reduce America’s prison population, the justice system’s costs, and crime, the article continued. “He is doing so despite the consensus that produced those changes. We should not let this rare opportunity to reform a badly broken criminal-justice system fade away, nor should we permit the consensus on reform to shatter under the consuming cover of a national scandal,” noted the article. 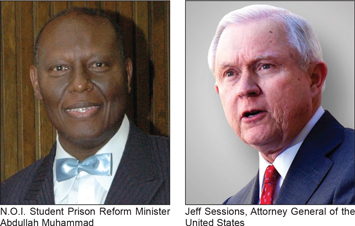 NOI Prison Reform Ministry Under Attack: Facts Rebut False Propaganda! Mumia Is Innocent: The Evidence Is There!